Out of the 63,426 incidents countywide last year to which Sarasota County Fire Department vehicles rolled, Siesta Key’s Fire Station No. 13 handled 1,520. 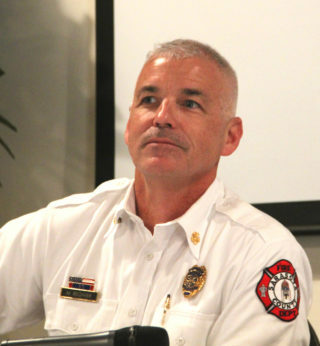 That was just one of multiple statistics Fire Chief Michael Regnier provided members of the Siesta Key Condominium Council during their Feb. 19 meeting. The month with the fewest calls was September, which had a total of 82, a chart showed. March and July were tied for the months with the highest number: 172. Of all the calls on Siesta in 2018, 1,212 were EMS-related, according to the statistics Regnier provided audience members. That meant only 308 of the total involved fire calls. Of the latter, 128 were related to alarms, the handout said. The department reported six swimming/recreational water rescues and seven watercraft rescues off Siesta in 2018; another 18 calls requested rescues of people trapped in elevators, the report showed. During the Condominium Council meeting, Regnier also took the opportunity to talk about an initiative underway that could increase the efficiency of the Fire Department without its having to add personnel, which is costs taxpayers money, he noted. If a person calls 911 today for a medical problem, Regnier explained, “We’re going to respond with red lights and siren.” A unit is required to head out on a call within 25 seconds, he continued. However, that often does not give the 911 dispatcher sufficient time to determine details about the reason for the call. While a rescue unit is in transit, Regnier said, the dispatcher continues to ask the caller questions. In some cases, he noted, a modification to the response is appropriate. For example, Regnier said, an older person who fell the previous day might not have had enough discomfort to seek medical help then. However, by the following day, the person is having difficulty standing. If that person is alone, the person might call 911 for a rescue unit. An ambulance would respond and take the person to a medical center, Regnier continued. However, he pointed out, that is not an emergency. Regnier has been talking with County Administrator Jonathan Lewis about adding 10 to 15 seconds to that 25-second response time. That would allow a dispatcher to determine whether an ambulance needs to be dispatched more quickly or perhaps not at all, he said. A fire truck might be the more appropriate vehicle to send, Regnier explained. “It’s very important to know that [information],” he added. As he did last year, Regnier also pointed out to the Condominium Council audience that the same type of medical equipment that is on every county ambulance is also on every county fire truck, and the crews are cross-trained: Firefighters can handle medical emergencies, and Emergency Medical Service crew members can fight fires. The only thing a fire truck cannot do, of course, he said, is transport a person to a hospital. Crews also are able to contact the drawbridge tender in an emergency, Regnier said, to ensure a bridge will not go up as a Fire Department or EMS vehicle is on approach to the island. Siesta architect Mark Smith, a past Chamber chair and continuing board member, is at work on a big idea for improvements to Old Stickney Point Road. During the Feb. 20 Chamber members meeting, Smith explained that his proposal is to create a business improvement district with uniform lighting, brick paver sidewalks and street furniture, similar to the features of the Public Improvement District in Siesta Village. Additionally, as in the North Village, banners would hang from the new light poles, he said. The south district would encompass part of South Midnight Pass Road, including the county-owned parcel at 6647 S. Midnight Pass Road. The latter is home to one building that is property of the Public Utilities Department, as well as underground pipelines. It formerly held a Sheriff’s Office training facility. He needs to get 10 property owners to sign a petition, Smith said, before Sarasota County staff will consider establishing the district. He had been working on the proposal through the Island Business Committee, Smith noted. He added that he feels he will be able to secure the necessary number of signatures. In August 2018, Siesta Key Chamber of Commerce members finally thought they were on the road to achieving a quest begun almost exactly five years earlier: installing a solar-powered, compacting garbage and recycling container in Siesta Village. The Bigbelly would replace a number of the steel garbage cans, Lisa Cece, special district coordinator for Sarasota County, explained during the August 2018 quarterly meeting of Chamber members. 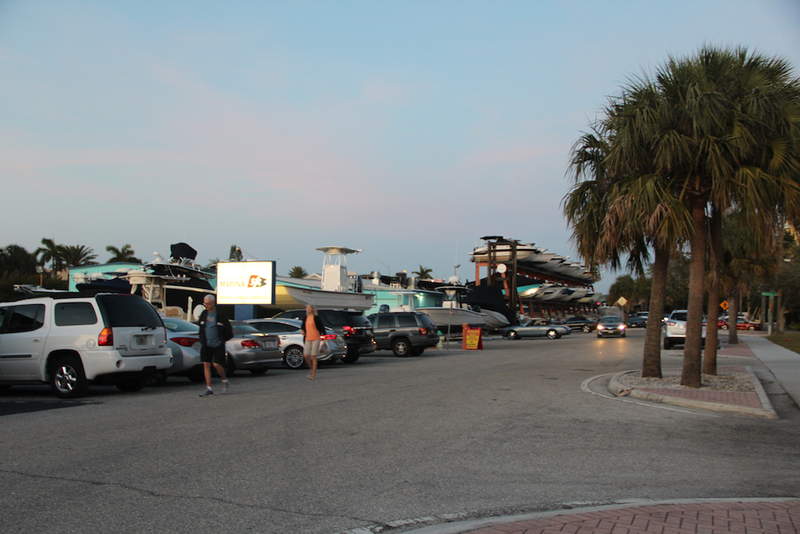 The idea for placing the equipment in the Village originated with Russell Matthes, co-owner of the Daiquiri Deck restaurants, before the Siesta Chamber absorbed the merchants group called the Siesta Key Village Association. Cece, who serves as liaison between the county and the Siesta Key Village Maintenance Corp., told the Chamber members in August 2018 that, during the tourist season that year, “We were inundated with the highest volume of trash that we have ever experienced” in the Village. Her goal, she said, was to see a Bigbelly installed near The Lobster Pot, at the intersection of Canal Road and Ocean Boulevard. Alas, the plan will not come to fruition after all, Cece reported during the Feb. 20 quarterly Chamber meeting for members. “Bigbelly doesn’t look feasible,” she said. In working with the company’s legal representative and the Office of the County attorney over the past months, she continued, she was unable to satisfy all the demands on both sides. For example, Cece pointed out, she would have had to estimate the number of new liners the Bigbelly would need over a five-year period. She also would have had to ensure the contract to lease the equipment had sufficient contingency funds built into it to deal with any damage — or even the destruction — of the Bigbelly. 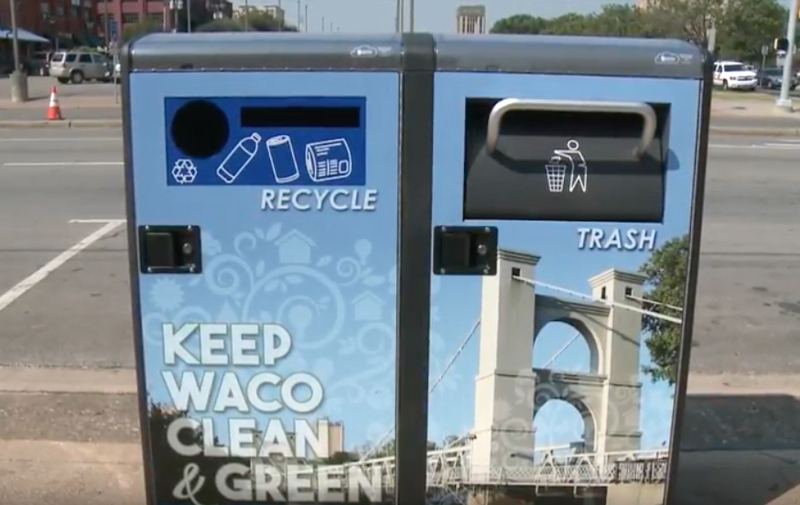 It would have held about 150 gallons of recyclables on one side and about 80 gallons of garbage on the other. The app would have been used to determine when it needed to be emptied, she indicated. She and Michael Shay, the Village Maintenance Corp. manager, had remained determined to try the Bigbelly on a pilot basis at the Canal Road/Ocean Boulevard intersection, she continued. However, knowing the history of accidents at that corner, she said, “The chance of [the equipment] being damaged or destroyed was real.” The owners of Village property assessed for expenses of the Village’s Public Improvement District could have been liable for replacing it, she noted. “I thought the lease was the way to go,” Cece said of the Bigbelly. “Unfortunately, they just made it impossible,” she added, referring to the attorneys on both the county and company sides. 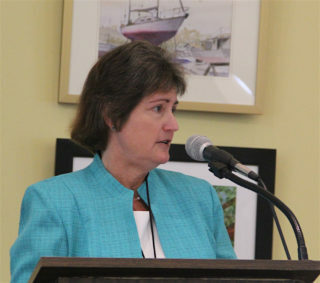 On a more positive note, Lisa Cece, the special district coordinator for Sarasota County, told Siesta Key Chamber members on Feb. 20 that she had just submitted the Siesta Village Maintenance District budget for the 2020 fiscal year to county financial staff. “The revenue collection continues to drop,” she said, referring to the annual assessments owners of property in the district pay for the Village upkeep. “You’re paying less every year,” she added, looking at some of the property owners during the meeting. For 2020, she continued, the total assessments will be about $130,000, down from about $140,000 in this fiscal year, which began Oct. 1, 2018. In advance of the County Commission’s passage of the 2019 fiscal year budget, the list of millage rates applied to special districts countywide showed that the FY19 rate for property owners in the Siesta Key Village Public Improvement District was falling by 21.46%, compared to the FY18 rate. “I pay down the reserve fund to keep your assessments as low as possible,” Cece said during the Feb. 20 meeting. Nonetheless, she noted, the Village does have more challenges, especially with the increasing number of excavations to add new utility lines to businesses and with the aging of infrastructure. Another issue that arose during the Feb. 20 Siesta Chamber meeting also was related to trash. 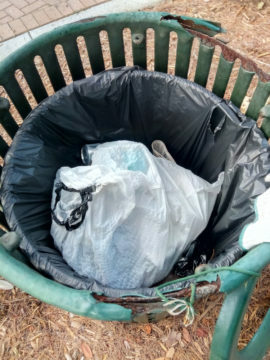 Lisa Cece, the special district coordinator for Sarasota County, reported continuing problems with individuals putting their personal garbage in the Village cans. A county Code Enforcement officer has visited offenders when Cece or Michael Shay, Maintenance Corp. manager, has been able to identify someone by items in the trash, Cece added. One routine offender, Cece continued, was a man who lives in a condominium to the north of the Village. She and Shay realized that the man must have been stopping beside a garbage can as he drove into the Village, so he could dump his personal trash into that can, Cece said. “We pulled [that can] across the street,” she added, referring to herself and Shay. “That took care of that,” she said, as it no longer was convenient for the man to use the garbage pail. Starting this month, visitors who come to Siesta Village by bicycle will have a new place to “park” their bikes. A new seven-space bike rack is expected to be installed at Bonjour French Café by the end of March, according to reports at the Feb. 20 Siesta Chamber’s quarterly meeting for members. Three benches had been situated in the vicinity of the restaurant, Village Maintenance Corp. Manager Michael Shay explained, but one of them had sustained quite a bit of damage. Because it was deemed beyond repair, Shay continued, the decision was made to replace it with a bike rack. Lisa Cece, the special district coordinator for Sarasota County, added, “A lot more people are coming into [the Village] to have their lunch,” and many of them are riding bicycles. She ordered the bike rack on Feb. 19, she said. It usually takes four to five weeks to get it delivered, she noted.